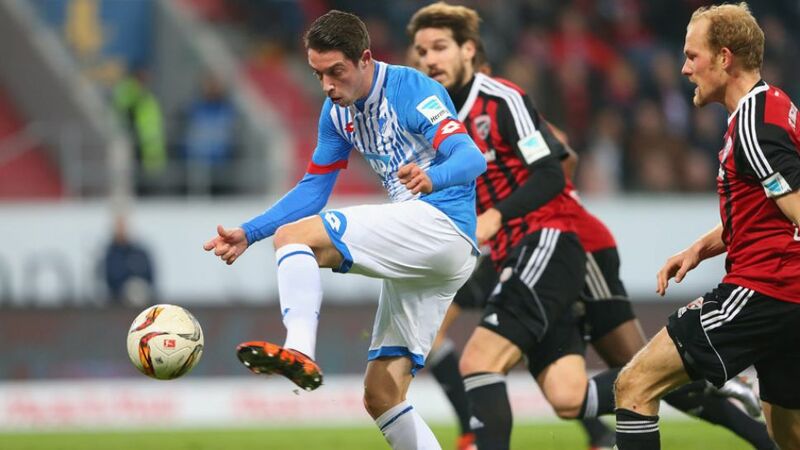 Mark Uth's last-minute equaliser salvaged a point for TSG 1899 Hoffenheim at FC Ingolstadt 04. The visitors, still searching for their first win under new head coach Huub Stevens, started the brighter of the two teams at the Audi Sportpark, but failed to carve out any clear-cut chances in the opening stages. South Korean defender Jin-Su Kim went closest to breaking the deadlock before the half-hour mark with a hopeful long-range effort, before Kevin Volland struck the post two minutes before the interval with a fierce shot that had Ramazan Özcan beaten all ends up. Hoffenheim keeper Oliver Baumann had precious little to do in the first half, but the 25-year-old was picking the ball out of his net on 63 minutes after Roger curled a sumptuous free-kick over the visitors’ wall and into the bottom corner from 20 yards. Stevens replaced Volland with Uth with 12 minutes remaining in an attempt to inject fresh ideas to the Hoffenheim attack, and the move paid dividends in stoppage time as the Dutch striker prodded the ball past Özcan from inside the six-yard box to send the away fans into raptures. Uth’s 95th-minute goal was the Dutchman’s first for his new club and Hoffenheim’s first on the road under head coach Stevens, who will be delighted with the impact of his substitute at the Audi Sportpark. Ingolstadt have made a fine start to their maiden Bundesliga campaign, but Die Schanzer have recorded just one win in their last seven league matches and are slipping ominously towards the foot of the standings. Ralph Hasenhüttl will know his side must improve if they are to preserve their top-flight status for another season. Roger's 66th-minute free-kick was his first ever goal for Ingolstadt.The Brazilian's strike was also Die Schanzer's first from a set-piece in the Bundesliga.Uth also opened his Hoffenheim account on Matchday 15.